Have a safe and happy spring break. School resumes on Monday, March 18. Remember, there is a make-up day for all students grades K-12 on Friday, March 29. Stillwater Middle School has been recognized as a Project Lead The Way (PLTW) Distinguished School for 2018-2019. 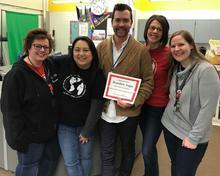 It is one of just six middle schools in the state of Minnesota, and one of 148 in the nation, to receive the recognition. The PLTW Distinguished School recognition honors schools committed to increasing student access, engagement, and achievement by providing opportunities in STEM (science, technology, engineer and math) courses. All of our middle school students take Project Lead the Way classes in grades six and seven, and as an elective in grade eight. High school students also have options to take PLTW electives. For the first time in more than three decades, the Stillwater girls basketball team is headed to the state tournament for the first time in 31 years. The Ponies captured the Section 4AAAA championship beating White Bear Lake 61-47. It was the 21st win a row for the Ponies who are 26-2 on the season. Watch the video. 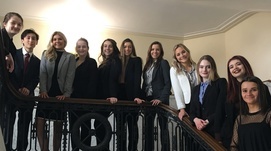 Congrats to the Mock Trial team who competed in the state competition. The Region 10 champions traveled to Duluth for the the event which was held at the St. Louis County Courthouse. Keenan Walker was named top team lawyer and Mia Pariseau was named top team witness by the state judges. Read more. All of our high school bands and orchestras groups that performed at the Minnesota State High School League's Large Group Ensemble Contest received a Superior rating. The Concert Wind Symphony and Concert Orchestra both earned 119 points out of a possible 120, garnering a perfect score from two out of the three adjudicators. The high school's 9th Grade Philharmonic Orchestra attended the Minnesota String and Orchestra Teachers Association's Tier 1 Orchestra Festival. They earned the rating Superior with Distinction and have been invited to perform at Orchestra Hall on April 15. Congratulations to this year’s winners of the Partnership Awards! The awards, given by The Partnership Plan, recognize teachers, staff and retirees for their work on behalf of students at Stillwater Area Public Schools. See more photos on Facebook. The school board has voted to move meetings to Stillwater City Hall beginning with the April 11, 2019 school board meeting. Board meetings will continue to be broadcast on the district’s YouTube channel and archived on the district website. Catch up on other school board news by reading the March 7 Board Notes. The Stillwater area parent groups are again hosting free on-site childcare for the school board business meeting to be held March 21 at the Oak Park Building. Please register your child(ren) online.